If you want to backup your iPod collection to Mac or iTunes or transfer incompatible media files to your iPod, then a powerful iPod to Mac transfer tool is needed. 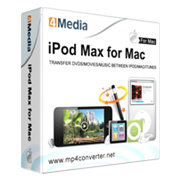 4Media iPod Max for Mac makes it easy to transfer and backup iPod music, photos, videos, movies, podcasts, and TV programs to Mac and iTunes. Moreover, you can download, convert, and transfer any DVDs/movies/music to iPod directly whether they are compatible with iPod or not. With this iPod manager for Mac application, you can connect multiple devices at the same time and transfer files between them. What's more, this smart application can also work as an iPhone media file manager, allowing you to transfer video/audio files between iPhone and Mac. Simply download the free trial now and try it for yourself. Transfer iPod/iPhone music/movies/photos to Mac quickly and easily; and copy your iPod/iPhone contents to iTunes with a single click to share and back them up. Transfer your favorite music, movies, and photos from the local Finder on your Mac to iPod or iPhone as easily as iTunes using this iPod transfer for Mac. Copy your beloved DVD movies to iPod/iPhone by first converting them to iPod MP4 videos then transferring them to iPod/iPhone. 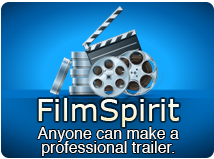 Add all popular video/audio format files including AVI, MPEG, WMV, WMA, etc. to your iPod/iPhone by converting them into iPod compatible MP4, MP3, and M4A formats automatically. This iPod manager for Mac enables you to manage up to 26 iPods and one iPhone at the same time; transfer and share files among them by a simply means of drag-and-drop. This iPod Manager for Mac tool supports the entire iPod family including iPod touch, iPod classic, iPod nano, iPod shuffle, even the iPhone (iPhone, iPhone 3G, iPhone 3GS, iPhone 4)! Now you can manage all of them effortlessly. Want to share files with different friends? This iPod to Mac transfer tool allows you to transfer video and music files to several iPods and one iPhone simultaneously. Create, rename or delete iPod/iPhone playlists; organize iPod photos with customized photo albums that you can create/delete/rename to your preference; import one photo into multiple albums for different requirements; view files as a list or as thumbnails and set illustration for music and movies in thumbnail mode; find the media files you need with the Quick Search or Filter function; rate your iPod/iPhone files. You can select from a list of recommended profiles to optimize your conversions or customize them by modifying settings such as video bit rate, resolution, frame rate, target format, and so on. Check detailed info of your music, movies, and photos; Edit the ID3 tags of several files at the same time to categorize and manage your music easily. By right clicking or double-clicking on a music or movie file in the list, you can play the selected file with the built-in resizable media player. iTunes-like interface and intelligent design makes file transfer between iPod and Mac simple and straightforward. Using this iPod manager for Mac, transfer any file from iPod to Mac, iPod to iTunes, or Mac to iPod in an instant. Added the photo album function. Supports iOS 4.1, iPhone 4 and iTunes 10.